In advance of the results and prize giving at our meeting next week I want to share the format of our certificates with you so you know what’s coming, and also briefly touch on what it is to achieve an award at a koi show and how our certificates help exhibitor’s understand their achievements. The format of our exhibitor certificates is basically a list of awards that exhibitor has won – and that follows the format of other koi show exhibitor certificates. We are adding additional information too that I believe will help exhibitors understand how they’ve done. First, lets consider awarding at koi shows. Awards at koi shows are relative to the koi entered in that show so when a koi achieves an award its vital to understand that it’s won that award out of a number of koi benched in the same category at that show. I believe this “out of” information is best shown on the face of the exhibitor certificate alongside the award description to help exhibitors understand how well their koi did amongst the competition in that show. For example, there were 5 baby sized kohaku’s in our Garden Show so the award “3rd in size and variety” for baby kohaku’s is written up on the certificate with the additional information, “out of 5 koi”. Sometimes it will reveal the slightly uncomfortable truth that a first place has been awarded when there was only 1 koi being judged in that class… but, showing that information is just being honest and transparent and in the context of a competition, I believe that makes it fair and in the exhibitors’ best interest. Our first Garden Show attracted enough entries so that there was competition for awards down through the awards and well into the “size and variety” classes. So we benefit because showing the “out of” information provides adequate context for an award like 3rd place in a category with lots of competition – for example, 3rd place in young sanke was won out of 7 koi and therefore that koi beat 4 others to win the award. 1st place in young utsurimono beat just 3 other koi to win that first place – I believe both are well won awards, but which award is “better”; is it the 3rd place in young sanke where the koi beat 4 others to achieve the award or the better sounding 1st place in young utsurimono? It’s subjective, but what I want to demonstrate is that a 3rd place award won under intense competition may have a less flashy description than a “1st place”, but the exhibitor should feel significant achievement nonetheless. We’ve put on more overall competition categories than in most open shows to provide as many opportunities as we can for each koi to compete for an award where it can place against a reasonable number of other koi. This means a koi winning 1st place in a size and variety class with little or no competition can still be assessed by how well it achieved in one of the overall awards for example, best in variety, best in size, best non-gosanke and so on. With this approach, the best thing we can do is to lay out as much info as we can sensibly put on the exhibitor certificates to provide transparency and allow exhibitors to understand the context of their awards. 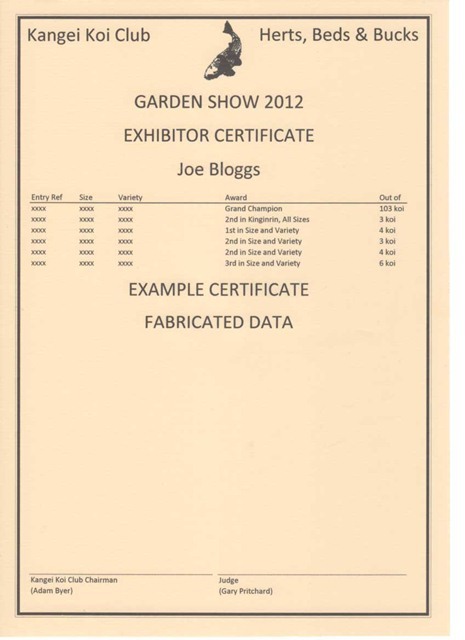 It’s our first year, and I would welcome feedback which we will consider when creating the certificates for next year’s show. I am excited about the big reveal next week, and look forward to seeing you there.